Most awesome teeworlds clan and community in the world! 3.. 2.. 1.. Let's jam! We wish you all goodluck. Which day of the week do chickens hate most? 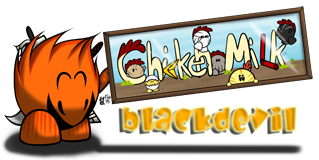 We had a teste of it when our first Chickenserver host has been shut down by a DDoS. Useless to say, only innocents payed for that attack. So basically we have some changes already, and I just saw that the website got updated, but these are currently the new changes we can see. And you can remove "FaFa" from the list. Thx for the changes alu! 1. is the CM page (This here) supposed to get updated aswell, since this still is an older list. i´m a bit late with the update of all portfolios, that will be hopefully done tomorrow or the day after. binx - Well it might be weird for me to comment this while I’m leaving the game, but I’m happy to see this happen. I know some of these names from my ctf5 games, I wish them good luck and lots of fun. No stress ^^ take the time you need to do it. real life is more important! Ujin is the experienced team and Sama for is meant for newcomers -> one "for" too much? I promised to write a post about the updates, so here it is. Add Jake and Sage as well as new members from my earlier post. Hope you can manage to fit these ones in! Thx alu for the updates! yey! lucky for the win!